I like to decorate with sweet things without getting a tooth ache. I was digging through the Christmas stuff trying to get ready for the upcoming season and I found this sweet cow. She is what's left of an old nativity. I've given the rest of it away but I kept her and a little donkey. I really thought that she should have a little more exposure than just at the holidays. 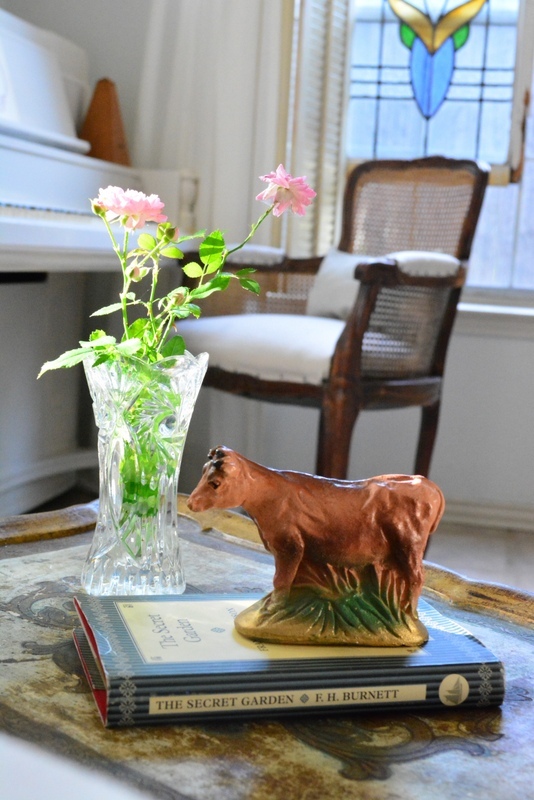 She provides a light farmhouse touch. Cows all over the room would be too much of a good thing. One little cow sitting on my favorite book. One little cow and the last of the summer roses. They are always so pretty in November. The Florentine table came from an antique shop for only $15.00. The French chair in the background got new upholstery. Just enough sweetness in a room of neutrals and white. I hope you are having a good evening. Sweet! I can't get over that pretty little table that you got for $15!